I survived my first day back at school today with some pretty good success. I forgot to take my camera with me, so you’ll just have to take my word for it. I had about a half an apple at work when I got hungry, and then around one I had lunch. I did my best to eat the weird green beans that they had, and attempted also to get some spinach salad down, but it wasn’t quite the same. I also put a bit too much dressing on it. Ah, well. So I had a couple of slices of pork loin for lunch. I had the opportunity to eat on campus for dinner, but I really wasn’t feeling it. I needed to make sure that I had enough time to change for TKD, plus a good friend of mine came over to visit, so I improvised. I fried up some chicken, without flour. The base of it is just spices. It’s similar to the fried/baked chicken that Anthony and I did a while ago, but I needed something more quick so I just fried up a chicken breast and chomped on that with some grapes. It was moderately tasty. There’s still a weird bitter taste that comes in with all the spices. Perhaps I will take some of these spice mixes and try and make some marinade out of them too, one of these days. I have to say that I’m pretty damn good at cooking chicken, if I do say so myself. I don’t mind chicken being a little under cooked so long as it’s juicy. When I cooked for my dad I always ended up cooking it too much and drying it out (which, of course, still wasn’t done enough for him), but now I can have it nice and juicy and scrumptous cause I’m just cooking for me! To those of you who were wondering, the party went really well. We had all gluten-free foods, because I have another friend on the paleo diet, and one more with Celiac’s. I still wasn’t able to eat anything too heavy, so I had some chips and dip (bad on: potatoes and dairy), and I also had some hot wings (tasty and not bad at all). 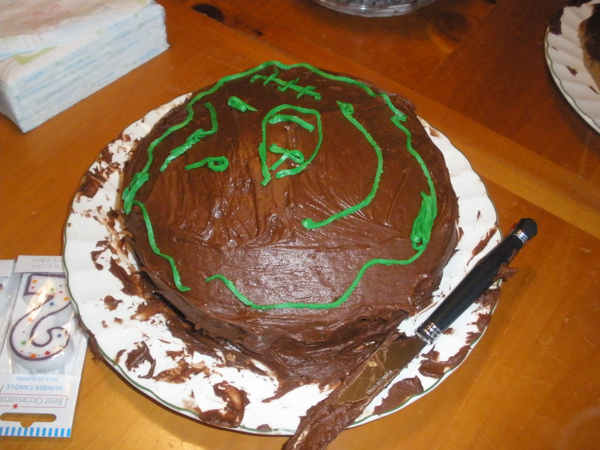 There were gluten free brownies and two gluten-free cakes, one of which my friend decorated into a draaaagon!!! Can't you see the resemblance? Both cakes were appropriate for me, of course. One of the things that I was worried about for the party was the start of a slippery slope. That I would taste good things and want to skip off the paleo diet, etc. but I have found that not to be the case. I splurged on Saturday cause it was my party, and then Sunday cause it was my birthday. I really didn’t have too much trouble transitioning back, though, and soon enough all the bad stuff will be out of my house. And I haven’t been craving or anything. Unfortunately, being back at school means back to homework, so I have to go tend to that. Posted on January 24, 2011, in Foods and tagged birthday party, foods, garlic fried chicken, junk food. Bookmark the permalink. 3 Comments. I do a great parm crusted pan fried chicken. If you’re interested, catch me downstairs some time.